shall I begin, your Majesty?" he asked. Jazz musicians say there are three stages to playing jazz. First, you must learn all about your instrument. Then, you must learn all about the music. And finally, you must throw it all out, and learn to play. The truth is that learning tango takes work. There are no short cuts. Like jazz, you must first learn all about your instrument... and that takes time. 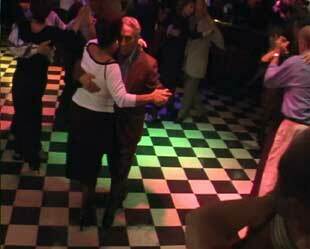 It can take years of jostling around the floors of crowded milongas to develop the centered, relaxed way of moving that's necessary to express tango—and it probably takes a lifetime to really absorb and understand the music. But a determined and dedicated student who focuses on the right things can still attain a high degree of competence without moving to Buenos Aires. It takes a genuine love of the Golden Age tangos, and a love for the learning process—but it can be done. Because I've been lucky enough to spend so much time dancing in Buenos Aires, I think I'm qualified to discuss the first two stages of learning that the jazz musicians talk about. We've already explored the music a little in Chapter 4, and now we'll begin to look more closely at our "instrument". We'll use words, music, pictures, and also video, to get a better understanding of what it takes to turn the body into an efficient tango-dancing instrument. As far as the final stage that the jazz musicians speak of—the epiphany of finally breaking through and learning to play—I wouldn't presume to give any advice. What we will do in this chapter is explain and demonstrate some of the practical tools of musical expression, and also point out some of the ways the best milongueros use the music. But we won't try to tell anyone how to find the entrega of tango. That’s a journey everyone has to make on his or her own.